These are the words of Professor Sebastian Brock (whom the so called Arameans always quote). From his book titled “The Hidden Pearl”, Volume 1, page 8. After the 7th century BC in the Assyrian empire we can’t speak anymore about a specific Aramean ethnic group, because the spread of the Aramaic language (among other nations) caused the disappearance of a specific Aramean ethnic race and from that time the term Aramean refers to speakers of the Aramaic language. It is because from the 7th century BC on it is not possible to identify the continuity of the Aramean ethnic group, so the only thing left of that thread to this date is the Aramaic language in all its facets. Although the term Aramean originally (i.e. before the 7th century BC) were referred to an ethnic group, however during this time this term often lost its meaning and it only refers to Aramaic-speakers, (i.e. which includes all foreigners who also spoke Aramaic). Brock gives some examples of the use of the term Aramean while the meaning is Aramaic speakers. For example Jews were sometimes called Arameans in the Achaemenidish Empire but in fact they were Jews who spoke Aramaic. He even mentions the term Aramean was considered as pagan (after Christ AD), (i.e. it would apply to any pagan such as Greek, Roman, Phoenician, etc.) while Syriac/Syrian would mean Christian. 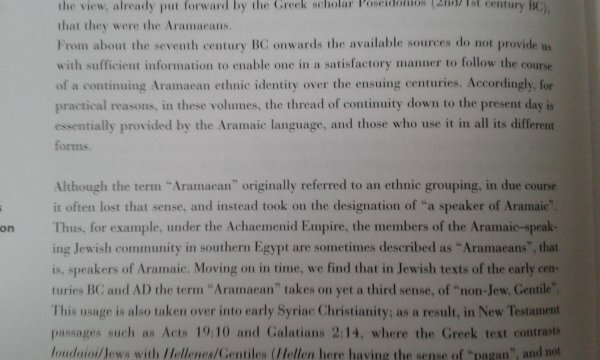 Brock states further that in the first 1000 AD the term Aramaya/Oromoyo, referring to the Aramaic language, (note how he is referring to LANGUAGE not ethnicity), was interchangeable with the term Suryaya/Suryoyo (Syrian) in Christian texts. Syrian writers used the term Syriac for Aramaic. Now here are my own personal comments: Obviously this is the most genius policy of the Assyrian Empire, it was the “Melting Pot Policy”. Because when the Assyrians adopted the Aramaic language and made it the official language of the Assyrian Empire, the Assyrians turned the Arameans into a minority in a sea of other ethnic groups where everyone else started speaking Aramaic. Prior to the 7th century BC, the Arameans had several city states that were a menace to the Assyrian Empire, and we also notice that many Aramean city states were allies with Assyrians, and also there were other Arameans city states that were against Assyria. The Assyrians backed their Aramean allies against their common other Aramean enemies, and both together destroyed that enemy. Then the next step was adopting the Aramaic language to absorb all Arameans in the Assyrian nation. And by doing that the Aramaic language was no more a national language of Arameans only uniting them, because from the 7th century BC on it became the language uniting all the nations of the Assyrian Empire where you have Assyrians, Phoenicians, Mitannis, Hurrians, Hittites, Hebrews, Amorites, Babylonians, Sumerians, Akkadians, all speaking that same Aramaic language, and that was what actually killed the Aramean ethnic identity, for two reasons, 1. They became a drop in the ocean (of other ethnicities). 2. They were stripped from their own identity. 3. Melting the Aramean identity because you could not know who is who, when all are speaking the same language, Similar to the situation in the USA, everyone who immigrated to the USA speaks English now, and after the third generation you would not be able to identify who is who. And since the 7th century BC we had cone through many more generations! Ironically the Assyrians did the Aramaic language a favor too, because on the other hand, with the Assyrians adopting Aramaic, it revived the Aramaic language and spread it to regions that Arameans wouldn’t have been able to do on their own, because they were nomadic goat and camel herding Bedouins that lacked school institutions, and lacked the muscle that Assyrians put behind the language, because it was the official state of Assyria with all its educational capabilities, international trade force, and military power behind spreading the Aramaic language, literarily imposing it on all its subjects throughout the Empire. Here we need to note that the Aramaic language was no more the sole property of Arameans, because after the 7th century BC it became the property of everyone using it, since the Assyrians had taken it from the Arameans and turned it into a Lingua Franca of the Ancient World, in other words they made the Aramaic language a Public Domain language. In conclusion, Yes we use the Syriac language in its derived from the ancient Aramaic language that was altered by the many nations that started speaking it after the 7th century BC, in other words when a foreigner speaks a language he tends to add his own terms (from his old language) to this new language, and that is why you see many Akkadian words in it. It is like when a Lebanese immigrates to the US, he picks up English, but when he speaks to his fellow Lebanese you find them using Lebanese words in their vocabulary. Syriac has its roots in Aramaic and Akkadian, as well as other local languages. However it is not exclusively Aramaic. And if the so called Arameans want to go to their language, then they need to dig into their archeological sites and resurrect the Aramaic prior to the 7th century BC because that was what true Arameans spoke, while its version after the 7th century BC, many nations contributed to it. Hence it is no more the property of Arameans. Finally, if Dr. Sebastian Brock, a scholar who had dedicated his life in researching this topic, says that there is no ethnic Aramean after the 7the century BC. Maybe the so called Arameans need to wake up and smell the coffee, and realize that they are living in the 21st century, which is 28 centuries after the date after which Aramean ceased to exist as an ethnic group. Or maybe they can't comprehend what a renowned scholar is saying!